My grandfather, James D. McKinnon, started a Chevrolet dealership back in 1939. I’ve always admired him for that, because, well, it was still part of the Great Depression that did not truly end until the start of the second World War in 1941. Chevy’s and GMC’s were a part of our family. In fact, the running joke was always that “Ford” was a four letter word. 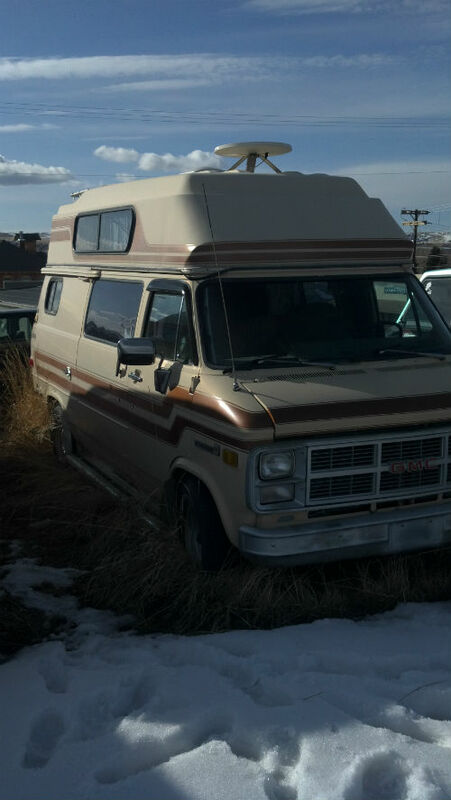 So my brother and I, growing up, always got to see, feel and touch the latest and greatest Chevy cars, trucks and vans that came on the market. She had no motor. 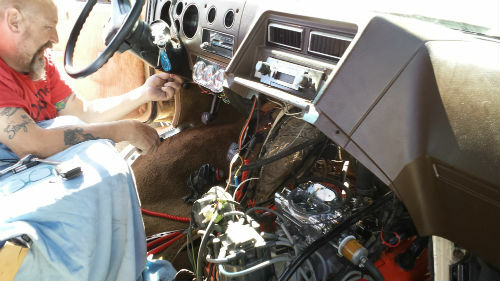 The story is that the nephew of the owner borrowed it and somehow blew the motor on a trip to the lake. So she had been sitting in this field for about 5 years. She was a bit sun damaged and faded, but she still had new tires on her and the interior was still in very good shape. She had a stove, a refrigerator, a kitchen sink, and oh, did I mention… a TOILET! She had a propane and water tank, and her body for the most part, completely straight and dent free (she does have a black eye on her left front quarter panel, but hey, we all have something). 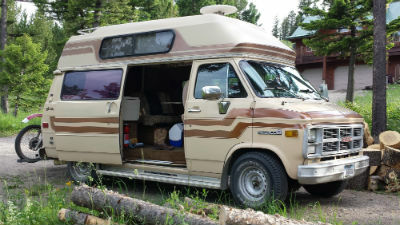 She was old, yes, but to me, she was a beautiful Chevy / GMC and she needed to be back on the road again. So with some very short negotiations resulting in her purchase for $250, I became her proud owner, and set out to rebuild her the motor that she deserved. 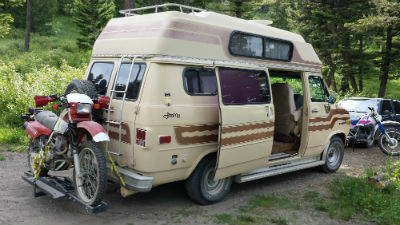 All said and done, Jenny would be on the road in relative style for about $3100. Jenny was actually named “Jimmy” by her manufacturer… which she agreed to much like we all agree to the names given to us… But after spending a little time with her, it became clear to me that she was in fact a girl, and she had been misnamed at birth. So Jenny she became, and I gave her new life. I told her I would take the “Jimmy” tattoo off her body if she wanted, but she insisted it was just a part of her past, and would wear it as a battle wound to remember her more difficult days. Bringing her back to life took a lot longer than i thought. 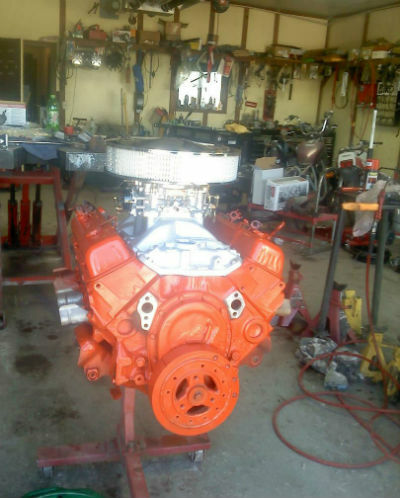 It was supposed to be three weeks… this was the original time estimate… and it turned into, well, with all due respect to my mechanic… we got’r done, and just in time for seeing the best of what Montana has to offer. I always like to say, all’s well that ends well. Here are some pics of the process. 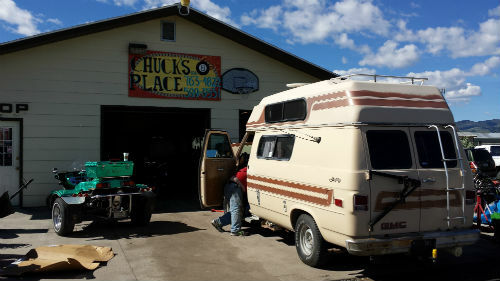 There was something cool about working with Chuck at Chuck’s place. I like Chuck, he’s a Marine, and once a Marine, always a Marine. No such thing as “ex” in their world. I admired him for what he had been through as a Marine, a bounty hunter, and a number of other interesting paths in his life. He’s one cool dude, and I have to say, in spite of how long it took to get’r done, it was great getting to know this dude, and making him my friend. I can’t tell you the feeling I had driving this beautiful ol’ gal down the road on this magical evening along the Gallatin River. It was as if at the same time, both Jenny and me, and perhaps even Chuck himself, sitting in the passenger seat, were set free in some way. Chuck, because the project was now nearly done, but for Jenny and me, how many years we had been trapped, how many years we just sat there in our own little lifeless misery, not going anywhere, not doing anything grand in our lives. We just existed, but were not really living. At this moment, we both began coming alive again, and somehow I knew, she had a smile as wide as her grill as I drove her down that road. In the final days before our trip, Jenny and I worked out the bugs and stretched our muscles, preparing for our journey. I got her a new windshield, some new wiper blades, filled up her water and propane tanks, a new stereo of course and otherwise took her to the spa for the rejuvenating and polishing she deserved. But we agreed… this journey and our times spent on the road would not be a beauty contest… this would be about living deeply and somewhere out on that road… getting back to who we are, and who we were meant to be. Now Jenny, I could tell, was most certainly the mothering type… It was a mutual feeling… I brought her back to life… and I know she appreciated this. In return, she was very willing to take on any challenge I presented her. 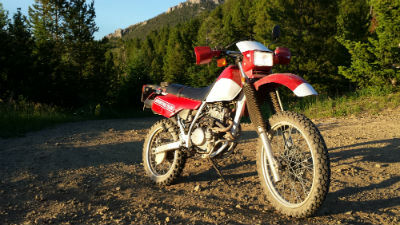 When I suggested we adopt a 1983 Honda XL 250R, and take her on our journey with us… she was not one to complain. 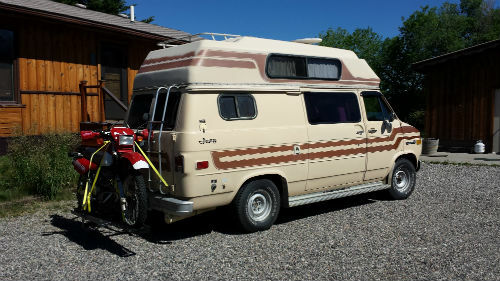 So for an adoption fee of $1450, Hahnna, our Japanese import, became the first member of our new traveling family, and with the purchase of a $79 cycle trailer on Ebay, we were nearly ready for our first family adventure. Here are some pics of Jenny and Hahnna packed up and ready to go… We took a short trip to my friend Jack’s place, about 45 minute into the back country of the Bridger Mountain range, and Jenny did just fine. She needed some adjustment on her parking brake, so with Jack’s tools, I did a little work on her over a few Coronas, and it seemed to do the job. The next morning I got on Hahnna and took her for a ride up to the top of the Bridgers… and on top of the world. Beautiful spot back in these hills and not a bad way to live. I’ll tell you more about my friend Jack and his family another time. Impressive how this man is prepared for just about anything that could come their way. He is known on the mountain as the “go-to” guy… a man’s man who can fix and do just about anything. Always impressive and an education to spend time with him. Now as with all introductions, you never want to overstay your welcome, so I will save the interior of Jenny for later. Besides, she is a bit modest and would not mind cleaning up the place before you visit. There’s nothing like a great story about a second wind. Jenny and Hahnna sound like two of the most excellent adventure mates! Looking forward to reading more about your travels. To think we all met somewhere above Mexico….Glad to see you’re on the ride. C & K, you guys most certainly fueled my fire when we talked… and I still think about taking a turn on the sea as you have… we will see where this wind continues to blow… Let me know what you guys are up to… did you buy the new boat yet? Ready for your next adventure? Isn’t life awesome! !